Last week in New York City, African-born Americans rallied outside the Libyan Mission of the United Nations to protest enslavement of black Africans taking place in Libya. The protest’s focus, according to Queens-based human rights activist Jacinta Elioba, was to show support for fellow Africans – migrants fleeing war and instability – some of whom are paying smugglers to escape their home countries and ending up sold into sexual and economic slavery. 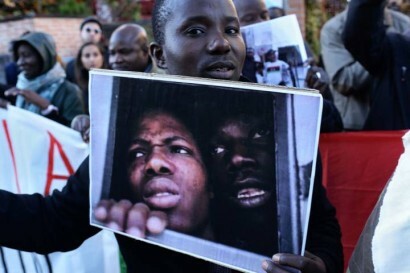 The protest, led by New York City-based activists including escaped slave and former champion swimmer Simon Deng, occurred alongside simultaneous protests in European capitals including Paris and Berlin (see photo above). Late last month, United Nations Secretary General Antonio Guterres called on “relevant” agencies of the UN to conduct investigations and bring the perpetrators to account. This followed release of CNN footage showing human beings being auctioned at slave markets in Libya. Deng says Africans fleeing from countries including Mali, Ghana, Nigeria, Senegal and South Sudan have become victims of the Libyan slave trade.